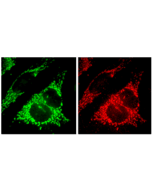 The mitochondrial protein Smac/DIABLO (second mitochondria-derived activator) performs a critical function in apoptosis by eliminating the inhibitory effect of IAPs (inhibitor of apoptosis proteins) on caspases. The newly synthesized Smac protein contains 239 amino acids. Its N-terminal 55 residues encode the mitochondrial-targeting sequence and are proteolytically removed in the mature Smac protein. In the intrinsic cell death pathway, the key event leading to the activation of caspases is the release of several pro-apoptotic proteins such as Smac/DIABLO from the intermembrane space of mitochondria into the cytosol. During apoptosis, Smac is released from mitochondria and re-activates the processed initiator and effector caspases by relieving IAP-mediated inhibition. Furthermore, Smac/DIABLO plays an important regulatory role in the sensitization of cancer cells to both immune-and drug-induced apoptosis. Promotes apoptosis by activating caspases in the cytochrome c/Apaf-1/caspase-9 pathway. Acts by opposing the inhibitory activity of inhibitor of apoptosis proteins (IAP).